Nonsense At The Museum: "The Turbine Went From 0 to 60 Seconds." You walk through a museum and you stop at an interesting exhibit. 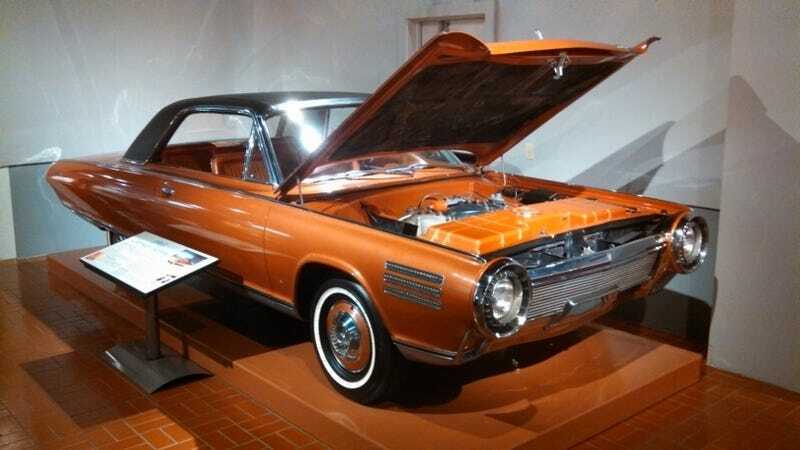 “Hey, there’s one of those Chrysler Turbine Cars. Let’s read the sign and see what we can learn.” If you are at the Gilmore Museum near Kalamazoo, this sign is what you will be reading. And what you “learn” will be wrong. The “Experimental Engine” paragraph is not bad. Calling the turbine engine “experimental” is a little bit of a stretch - they were past the experimental stage with the engines at this point but I understand that “experimental” to some people means “new and confusing.” Like that experimental internet. I don’t get pissed off until the next section. “It’s One Hot Car!” According to the second paragraph, its exhaust smelled “bad” and measured a “scorching 525 degrees!” Wow. That sounds dangerous. If only it were true. The 500+ degree figure which they are quoting is the temperature of the exhaust gases as they pass out of the regenerator. At the front of the car (red arrow). Those gases then pass through a very long, wide dual exhaust system to the back of the car (blue arrow). Most people - when they read that language - assume that the figure is for the tailpipe. As in “I heard those things melted the asphalt as they drove down the highway!” Does anyone measure the temperatures of piston engines at the exhaust port and freak out? Think of the children! The exhaust was not dangerous. It was actually cooler than the emissions from a tailpipe of a regular car at that time, below 200 degrees f. George Huebner’s handkerchief is not about to burst into flames in this picture. And, for what it’s worth, I drove one of the Turbine Cars and when the owner pulled it out of his garage I walked behind it and felt the exhaust, just so I could say I did it. And yes, I still have full use of my hand. The sign then says “Although not as prone to breakdowns as a piston-powered auto, the car’s ‘jet’ engine spewed superheated gases and gobbled up fuel like a 747.” The Turbine Cars in the user program had a very good reliability record (they logged over a million miles) and I suspect they got slightly better mileage than a 747. Of course, it’s hard to know: Chrysler never released figures. But from what I’ve read, a 747 burns several gallons per mile in the air; when “driving” on the ground it burns even more. “Chrysler built 50 Turbines in all.” They built 55. I hate to quibble but 50 does not equal 55. “[T]he Turbine received a big ‘thumbs down’ for its poor efficiency and economy.” Again, not true. The car was popular with those who used it and Chrysler could have sold the cars quite easily. The problem was the cost of the cars and the fact that the cars did not meet coming tailpipe emission standards. “All but ten of the cars were scrapped.” Nine cars were saved. At this point, I might be willing to concede that, for these purposes, 9 = 10. After all, it is less inaccurate than other things on the placard. “The Turbine went from 0 to 60 seconds.” Yes, yes, it did. Wait. Huh? Okay, I know this is just a ridiculous typo. But still, if you are going to publish nonsense, can’t you at least proofread it first? “[I]t got only 12 miles to the gallon.” They’re just making this up since Chrysler never released actual figures on this and as far as I know, no one has ever done an EPA-style mileage test on any of the surviving cars that run. “Chrysler abandoned the car just in the nick of time - the gas crisis was right around the corner.” This is the one that kills me. Chrysler didn’t “abandon” the turbine program until the 1980s - more than two decades after this car was parked. Chrysler built turbines until 1983 and did not close their turbine program for five more years after that. The entire sign in front of this magnificent car at the Gilmore paints a picture of the car being a loser, a sad sack whose only place in history is that of a curiosity which Chrysler wisely rid itself of. My understanding is that the sign was lent to the museum with the car - the car is on loan to the Gilmore from the Detroit Historical Museum. I have no idea who wrote the sign. I just wish they would correct it or take it down. Photo clips of the sign are courtesy of Levi Stombock.